Black & White is a terrific concept for an exhibit – it’s so contrast-y. The Children’s Museum of New Hampshire’s upcoming show on that theme includes fifteen of my drawings. One is a graphite frottage, a technique related to rubbings, only more creative in that the textures are combined to make new images. I am also using frottage for a non-fiction picturebook. Another is a charcoal still life of moonsnail shells that’s part of a series where I try to make still lifes not so still. 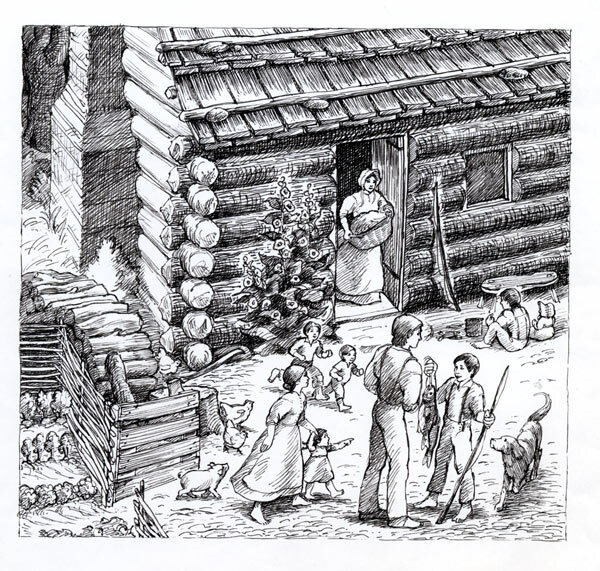 All of the others are delicate pen and ink drawings I did for Log Cabin in the Woods by Joanne Landers Henry. It was originally published by Macmillan in 1988, then eventually republished by Emmis Books. It brings to life the true story of eleven-year old Ollie Johnson and his family, who settled in the wilderness of Indiana in 1832. You can read an article about the exhibit here. Also included are works by Jill Snyder Wallace, Bruce Iverson, Bill Baber, Carolyn Vibbert, and Bill Paarlberg. This entry was posted in children's books, previously published and tagged children's books, Joyce Audy Zarins. Bookmark the permalink. Post a comment or leave a trackback: Trackback URL.